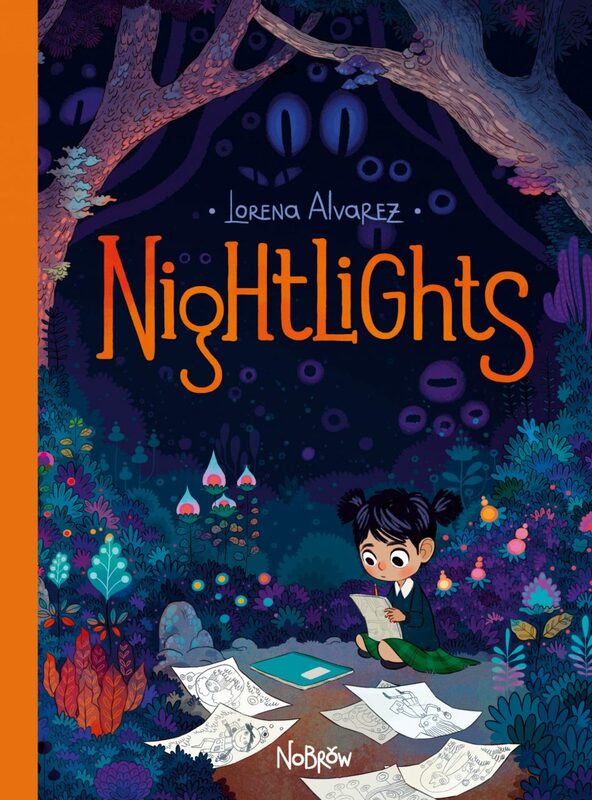 Lorena Alvarez’s Nightlights is a book of wonder. 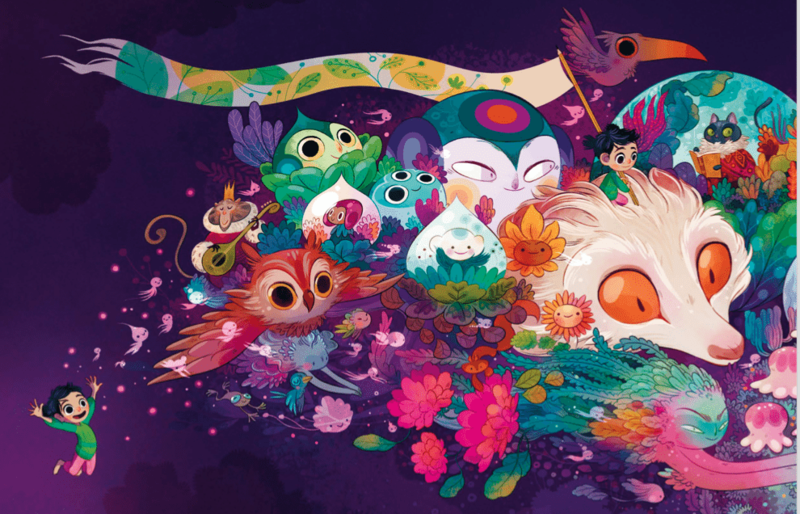 Before you even take a peek inside, you’re drawn in by the stunning cover with its dark purples and greens, light pinks and oranges, and aquatic blues. I wanted to read this book when I first saw the cover almost a year ago and in hard cover, it’s even more stunning. 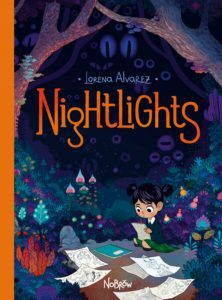 Nightlights is about Sandy, a little girl who captures the tiny lights in her room at night and turns them into fantastical creatures. She then recreates them in her drawings. The drawings are pretty good, and a mysterious new girl named Morfie agrees. What I love about this story is less of what happens but more of why it happens. Morfie is a seductive presence in Sandy’s life because of the interest she’s shown in her drawings, telling Sandy that they’re great. Sandy is constantly told to focus on things outside of her drawings like school—there’s no real acknowledgement of her passion from the adults in her life, so that attention from Morfie makes a big impact. However, it’s those annoying things like homework that end up being Sandy’s salvation. Every single page is breathtaking. The story demands a flurry of turns but the art beckons you to go back to the start and do it all over again at a glacial pace. You need to take in every detail and allow the vibrant colours wash over you before moving onto the next. 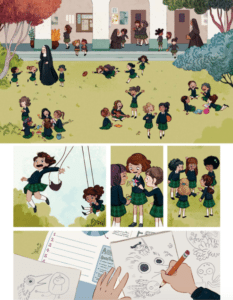 I am as invested in the massive splash page as I am in the panels of the busy city streets or school yard. Alvarez also has a knack for expressions. I almost immediately fell in love with Sandy because I got to know her pretty well from her varied faces throughout the book. She’s a spunky kid with her head in the clouds. She gets scared, frustrated, and infused with joy. 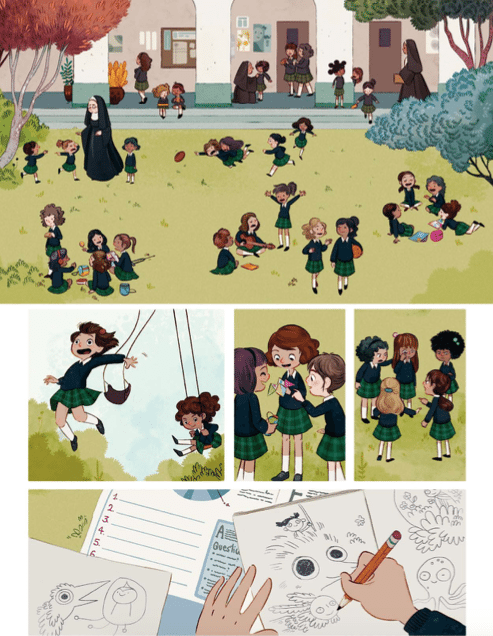 In the school yard, Alvarez takes her time showcasing the different students and nuns with their distinct facial expressions and actions. There aren’t any words but the art continues to tell the story. The beauty of this book is in its ability to inject awe in not just children but in adults as well. If you haven’t grabbed a copy for yourself, do so now and cuddle up with your little one or with a warm cup of tea.